Can guinea pigs be potty trained? Not like you would think, but we can work with their natural instincts to get a 75-90% success rate! Guinea pigs are prey animals and when eating and pottying, most prefer to do so in safety. One of their biggest threats in the wild is predatory birds. A cage with a lot of wide open space without a nice balance of hideys and cover can be intimidating and uncomfortable for them. 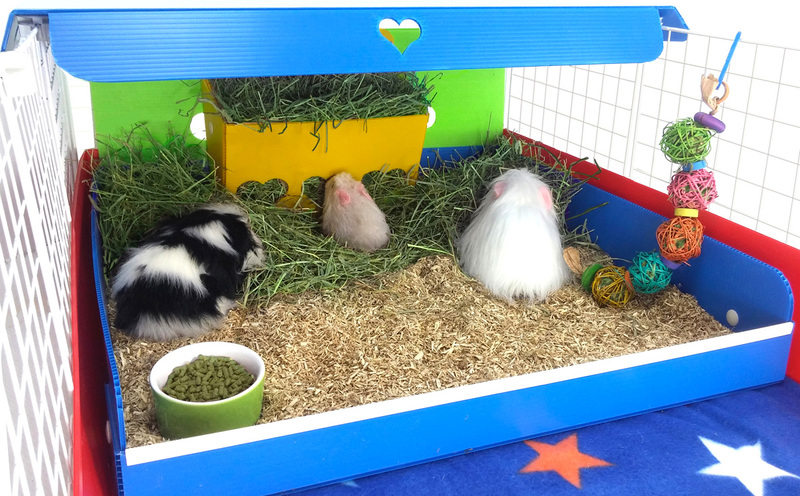 Guinea pigs, bless their hearts, will eat and potty in the same area -- especially when munching on hay. In addition, they feel most secure for pottying and eating in the furthest, darkest corner away from you. Many people don't use all disposable bedding anymore, for a variety of reasons -- dust, cost, shopping, and mess being the biggest drivers. BUT the problem with using all fleece for bedding instead is that while it's okay for urine absorption, fleece does absolutely nothing for poo absorption. With good disposable bedding, the poos are dried out and mixed in with the bedding so that they don't have to walk in nor lie in their wet poos all day. If you are using 100% fleece for bedding, you must do poo-pickup in the cage at least once a day. Twice a day is actually preferable. So, cage cleaning in an all fleece cage is 2xDAY. Cage cleaning in an all disposable bedding cage is 2xWEEK (depending on a number of factors). Add a Cagetopia kitchen insert -- a Coroplast litter area -- to your cage to contain the disposable bedding. 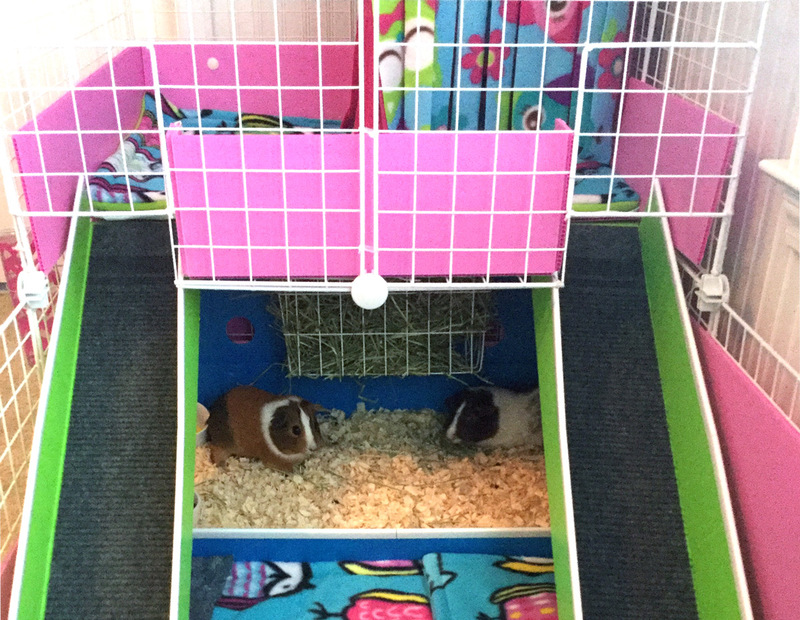 Put fleece bedding in the rest of the cage. Yes, you're still spending some money on disposable bedding, but nowhere near as much as if you had to fill the whole cage. Yes, you are still doing laundry and some poo pick-up, but not as much or as often as when using all fleece in your cage. In the recommended cage size for a pair of females (the large, 2x4 grid cage), the Cavy Cafe kitchen takes up 1/4 of the cage and Fleece Bedding is in the remaining 3/4 of the cage. The Cagetopia kitchens are lipped low enough for the pigs to easily walk, run or hop over and high enough to keep most of the disposable bedding and hay contained. Position the COVERED kitchen area at the end of the cage that is the furthest away from you. That will be where they will run to for safety and security. Tailor your environment with that as the objective. Cover your kitchen area with a Cavy Canopy, a Picnic Awning from the Market, or an Upper Level! The Cavy Cafe can be easily lifted out and the loose bedding just dumped or scooped out into a garbage bag right in front of you. Then, you just spray and wipe it as usual with a bottle of half white vinegar/half water and add new bedding. That is the litter area. You put the water bottle, pellet bowl and hay rack, hay pile or hay bag in this area as well.